We’ve been busy updating the shop side of things this summer, you can now actually order original Kenyan sevens directly from the blog. You’ll find the different categories under music shop on the right. There are only a 100 singles added so far, we will add more during the next months. The elusive Almasi label is always interesting as the styles in the music differs from each release. 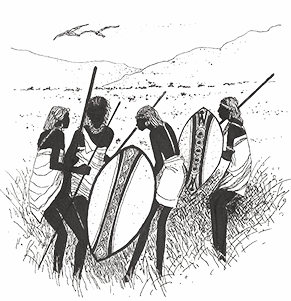 Can’t find much information about the band but it’s pretty certain they originate from the town with the same name in the Rift Valley province. Note that in seventies Kikuyu Benga the foremost and predominant instrument used is the guitar, it’s nice to hear an organ in the arrangements for a change. That’s quite interesting. A Kikuyu melody done in a South African style. 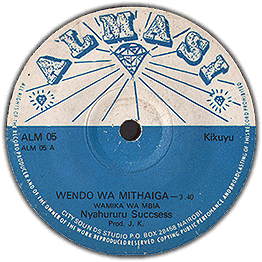 I don’t know anything about the Almasi (Diamond) label but you can see it’s part of Joseph Kamaru’s City Sounds Studio and it appears Kamaru produced this particular recording.